Posted November 13, 2013, in News. 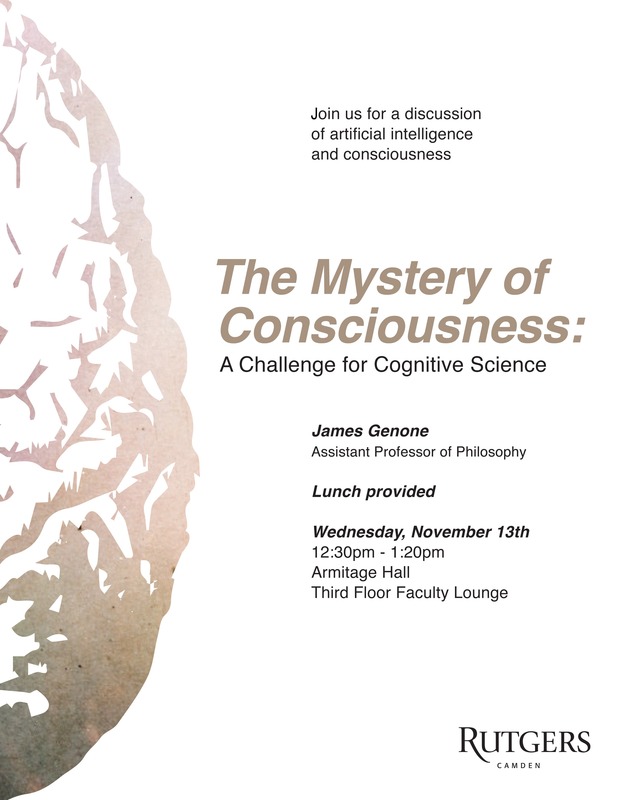 Professor James Genone will lead a discussion of artificial intelligence and consciousness on Wednesday, November 13th, from 12:30-1:20 pm in the Third Floor Faculty Lounge in Armitage Hall. Lunch will be provided. Page last updated by Department of Philosophy and Religion at 12:19 pm March 18, 2014 . This page was printed from http://philosophyandreligion.camden.rutgers.edu/2013/11/13/the-mystery-of-consciousness-james-genone/ at 3:59 PM Friday, April 26, 2019.